A. L. Lofton, who contributed the picture above, notes, "At the foot of the steps are sections of the original round columns, which were replaced by double square columns, until round columns could be purchased." The original plantation lands are located party in Charleston County and partly in Georgetown County. 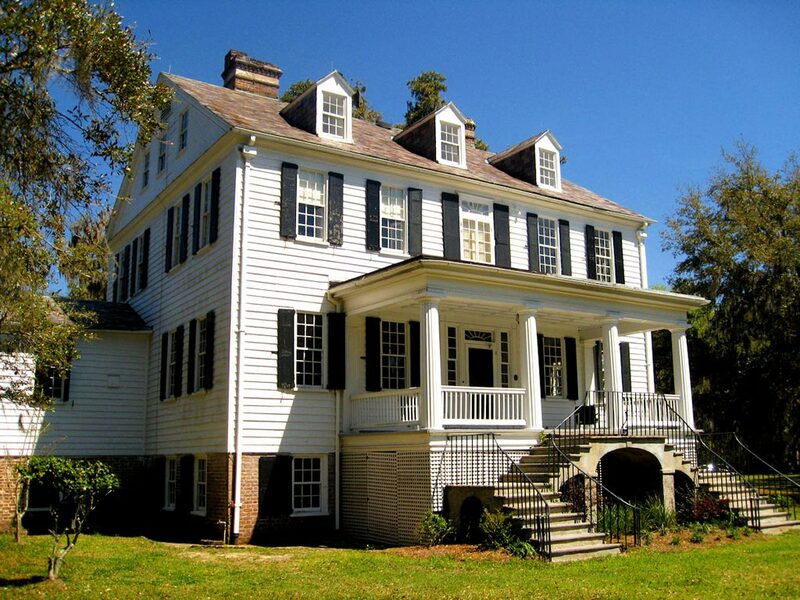 The plantation house is located off US 17 on Wedge Plantation Road in the Francis Marion National Forest. The original rice fields are located across the South Santee River in Georgetown County. Origin of name  The boundaries of the property form the shape of a wedge. Current status  In 2015, the University of South Carolina still owned the plantation and had leased out the plantation (10). Elizabeth Deas Middleton owned property on the South Santee River. Upon her death, the property was divided into Wedge and Pine Tree Hill plantations (3, p. 741). 1802  John Hume purchased Wedge which consisted of 47 acres (3, p. 741). 1819  John Hume's daughter, Charlotte, married William Lucas, and it is presumed that they were given Wedge. No documents exist of this transaction (2, p. 266). 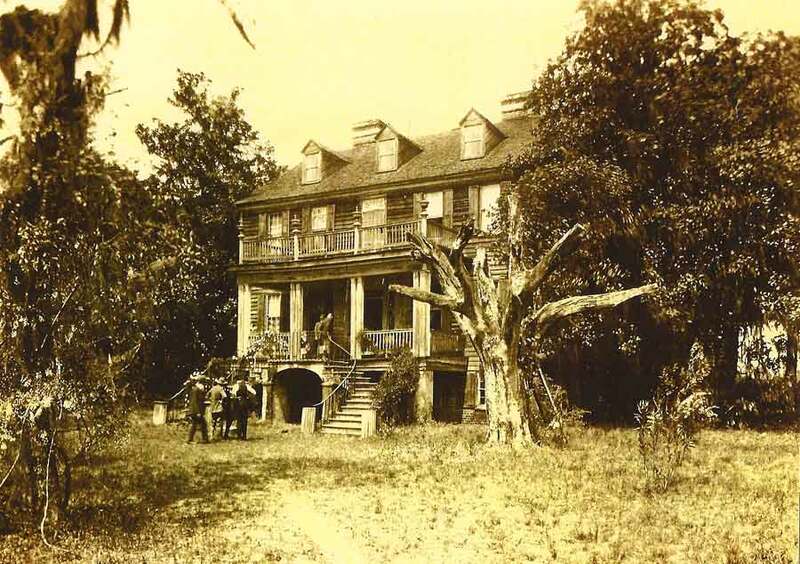 1826  William Lucas built a house on the property. The National Register nomination form dates the house to the 1830s, but this is an error. The deed the nomination form is referring to was the deed for 45 acres on Washashaw Creek purchased by William Lucas from his father-in-law, John Hume (3, p. 842). 1866  William Lucas transferred the property to his son Alexander Hume Lucas (1). 1892  The house caught fire when sparks from the chimney set the roof ablaze. The fire was put out and the house was saved (2, pp. 309-311). 1914  Alexander Hume Lucas died. At this time, Wedge ceased to be a working plantation. It remained in the family for another fifteen years (3, p. 742). 1929  Wedge was purchased by Mr. and Mrs. Elbridge Gerry Chadwick. They also purchased Palo Alto and Woodville, two neighboring plantations (3, p. 742). 1946  Charles H. Woodward purchased the plantation and used it as a winter residence (1). 1966  Dr. and Mrs. Richard B. Dominick purchased Wedge and Belleview plantations. Dr. Dominick set up an experimental laboratory to study insects. He was interested in collecting moths and butterflies (3, p. 742). 1976  Dr. Dominick died and the State of South Carolina purchased Wedge. It became home to the University of South Carolina's International Center for Public Health Research. 2007  At this time, Wedge was still owned by the University of South Carolina. The university hoped to lease Wedge to a private party (3, p. 742). 2014  The University of South Carolina put the property up for sale through a bid process with a minimum bid of $4 million. This process resulted in no bids meeting the minimum. In November 2014, USC accepted an offer of $4 million from a buyer who was not disclosed (7) (8). 2015  Wedge Plantation was once again on the market with an asking price of $4.25 million. It is unclear if the sale negotiated in 2014 fell through, or if that purchaser placed the property for sale. It appears the plantation was still owned by USC as later this year Wedge was leased to an unknown party by the university. USC had been seeking a 10-year lease (9) (10). Number of slaves  In 1850; William Lucas owned 72 slaves on his various plantations (1). The main house is in the Federal style with 8,665 square feet. There are also multiple outbuildings on the property (7, p. 4). Lease information - Plantation Services, Inc.